Travelling to anywhere, I believe that you don’t miss to taste unique foods while visiting there. Through the foods you take one more chance to know more about the cultural and customs of the local people. I think all of us not only want to eat delicious foods but also want to know how to do, what ingredients and recipe are. Many foreign tourists are attracted by not only Hanoi’s natural scenery and specific urban architecture but also foods only in Vietnam. I really don’t know your tastes and what foods you want to eat…but you can see the following top foods that Hanoi people consider them as specialties to invite guests. And I also see many foreign tourists usually mention about them. 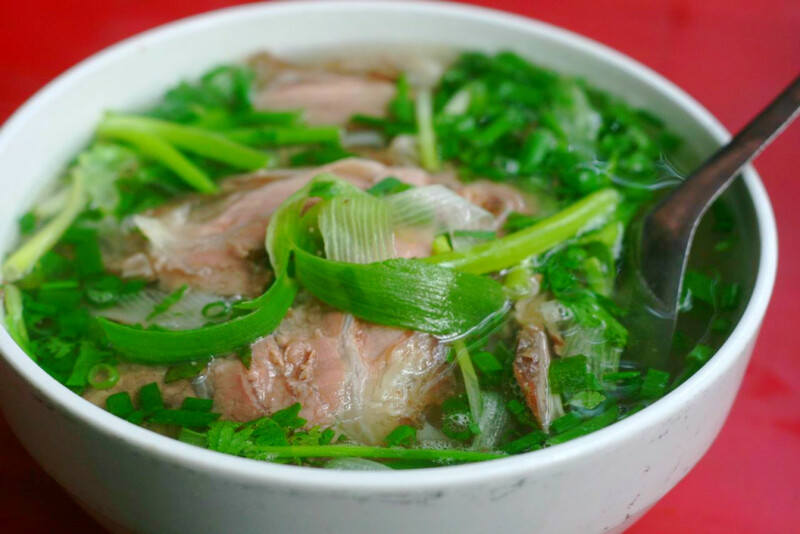 You might read many articles about Hanoi Pho that is the popular food of Hanoi Vietnam with many types of Phở bò (noodle soup from beef), Phở gà (made from chicken) or Phở ngựa (from horseflesh). The feature of Phở Hà Nội to distinguish it from other foods is it’s cooked by linguine-shaped noodles (made from rice flour) are steamed, dipped beef and the soup making Phở is more delicious and flavorful. Pho is the famous food that you can’t miss when visiting Hanoi. So where can you eat Hanoi noodle soup? Tourists usually go to the following address: Pho Bat Dan (in Bát Đàn Street - please check here: Best Pho in Hanoi), Pho 24 and Phở Gà (chicken noodle) at Le Van Huu St., Pho Sốt Vang at Ton Duc Thang street… Beside you can taste fried noodle in Truc Bach Lake (check in Hanoi west lake). 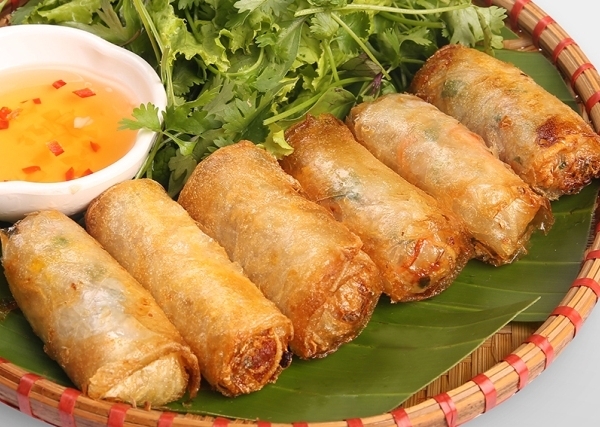 Spring Roll is called Nem Rán by northerners or Chả giò by southerners. This dish is made from spicy meat or shrimps, mushroom, dried onion inside, all are mixed throughly and wrapped with thin rice paper into roll (called nem) then fried in boiling oil. You can eat spring rolls with flavorful spices including fish sauce, chilli, pepper in perceived way of Vietnamese people. If you want to eat Hanoi spring rolls, you should go to Huong Lien diner at Le Van Huu St., Hai Ba Trung District where Mr. Obama- U.S.President has ever gone to eat while in Hanoi Vietnam. In addition, in the Old Quarter of Hanoi, you can see many spring rolls restaurants and diners anywhere. Chả cá Lã Vọng is at No.32 Nguyen Truong To Street, near Hanoi west lake. Grilled fish is usually served with noodles or rice, yellow one served with roasted peanuts, sauce of macerated shrimp very fragrant, delicious and marvelous. Làng Vòng green sticky rice is special food only in Hanoi. Not only foreign tourists but also Vietnamese people like, want to taste and buy it when they go to Hanoi Vietnam capital. There have thousands of articles about green sticky rice that is included in poetry and Vietnamese books in schools. How to make cốm làng Vòng? "Com" is freshly harvested sticky rice and it is made by farmers in Vong village that is located in the west, 8 km from Hoan Kiem Lake. 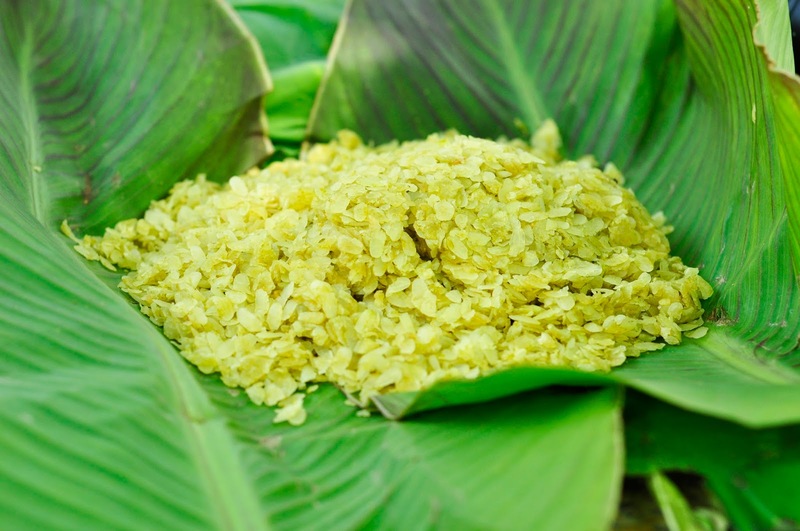 It is made from sticky rice grains by boiling and pounding to get rice inside – called is Com. Com grains are wrapped in green lotus leaves to sell to tourists. From com grains, the farmers also make many kinds of cakes. If you want to eat Hanoi green sticky rice, you can buy it in the big hotels but it is only in the autumn. Stuffed pancake is one of the dishes should enjoy when coming to Hanoi. 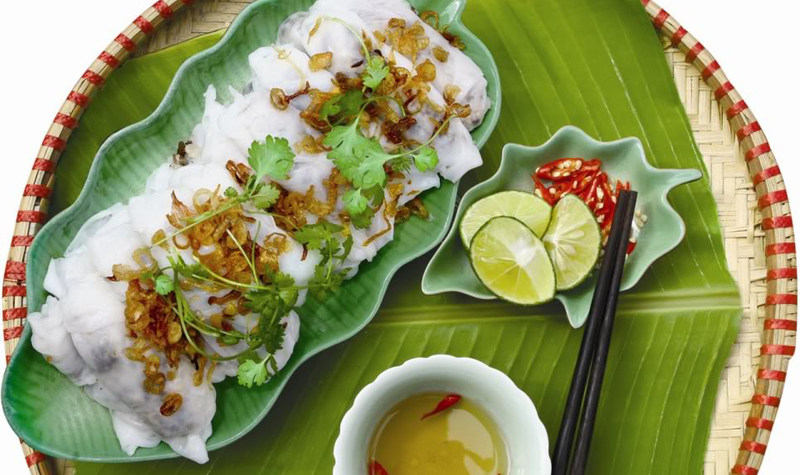 Specially, Thanh Tri Stuffed pancake is famous with delicious flavor. Called is Thanh Tri Stuffed pancake (product of a district that is located in the south of Hanoi, 9 km from Hoan Kiem Lake) but around the Old Quarter, there have a lot of restaurants with this cake now. However, the most famous restaurant is Ba Hoanh at To Hien Thanh Street (please check on Google Map). 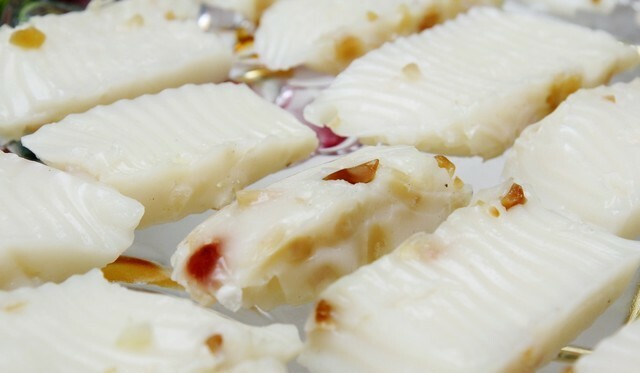 Hot molded cake is rice cake made of rice flour and lime water. It is a delicious dish in winter in Hanoi. Some large hotels may serve this dish for you in the morning. If you want to eat right on the street, you can ask people in the Old Quarter of Hanoi about hot molded cake, they will show you the diner’s address with delicious dish. Hanoi has many hot molded cake diner but the famous address is at Le Ngoc Han Street (about 1km from Hoan Kiem Lake), Pham Ngoc Thach St. (about 3km from Hoan Kiem Lake) or Dormitories 4B at Nguyen Duc Quy (8km from Hoan Kiem Lake). You may not able to eat tofu rice vermicelli with shrimp paste in the first try. It’s taste is very strong and unique that can make you feel uncomfortable. But it is affordable and interesting food for almost people of Hanoi. Tofu rice vermicelli (including noodles made from rice and tofu is made from soy beans) and shrimp (sauce made from small fishes). You can see tofu rice vermicelli with shrimp paste at anywhere in the Old Quarter of Hanoi. If you go along to Hang Dao, Ta Hien, Ma May Street... and see women with heavy burdens on the shoulders, two burdens are two bins and red fire coal stoves which can be salespeople is selling tofu rice vermicelli. 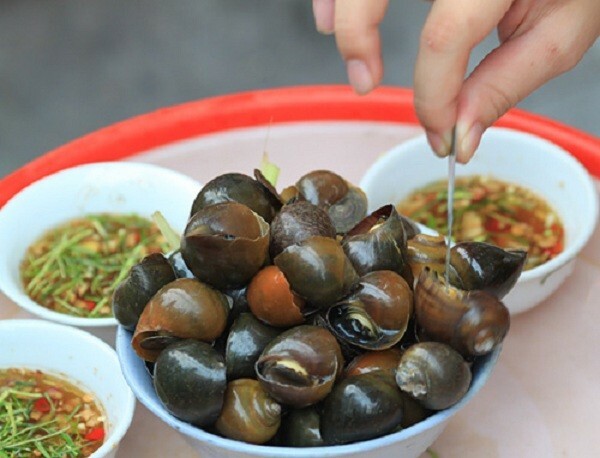 I’m not sure that you may able to eat this hot snails but it is a specialty food of Hanoi people. 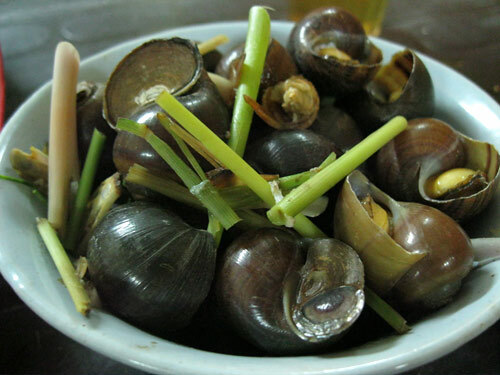 Hot snails are living in the mud of rice fields, farmers caught them, washed, boiled or cooked into many unique dishes such as: boiled snails, fried snails or snails soup. Hanoi people like eating hot snails but restaurants are quite remote from the Old Quarter of Hanoi. If you want to taste this dish, the nearest diner is Ong Gia at To Ngoc Van Street of Hanoi West Lake, 5km from Hoan Kiem Lake. Cha ruoi is special food of Hanoi which is sold in Thanh Ha lane and Ô Quan Chưởng gate in Hanoi Old Quarter with price is 35.000 Vietnam dong for one serving.